Manufacturer of All Kind of Metal Stamping Parts & Components. 1. Speed: 5400 RPM (+/- 10%). 2. Bearing: ball + sleeve. 2. Overall dia. : 50L x 50W x 35.5 (mm). 4. 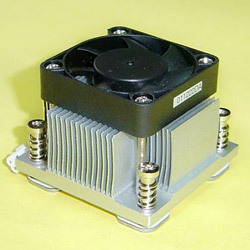 Heatsink size: 50L x 50W x 25H (mm). 5. Heatsink maerial: alum. 6063 - produced by fins skiving tech. With well surface treatment (one piece structure). 6. Thickness of fin: 0.45mm. 8. Fan size: 40mm x 40mm x 10mm. 9. Max. airflow (CFM): 5.62 (CFM). 10. Noise level: 24.87 (dba).